Registration Cut-Off: Nov. 13, 2015, Friday, 12NN. Please register immediately. We will not be entertaining walk-ins. Thank you. To secure your registration, we are charging a modest amount of PHP (Philippine Peso) 5,000.00 for 2 days of training for cost of venue, meals and training materials. Slot will only be reserved upon full payment, and coordinated with Lorentz partnerACADEMY. As seats are limited, we will not entertain walk ins. Upon payment validation, we will send you confirmation email that your slot has been reserved. Diet restrictions, medical conditions we should be aware of, emergency contact information, etc. Account Name: Sunelec Photovoltaic Solutions Inc. NOTE: Interbank fund transfers will be accepted; however, processing charges are automatically deducted. Kindly ensure that the amount of fund transfer covers the whole amount of the training fee, including the charges. 1. Each participant must have a separate registration form. 2. 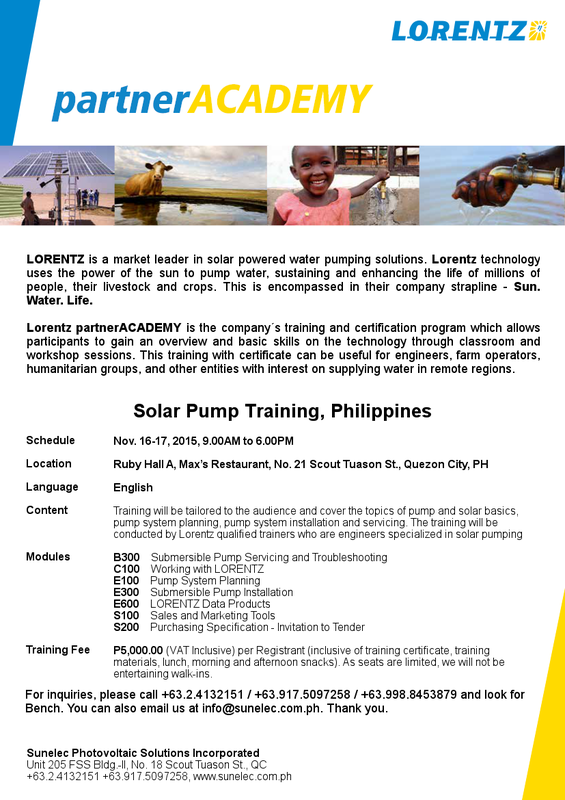 Upon registration, participation fee is payable in full by client to Sunelec Photovoltaic Solutions Inc.
3. Should a client who has paid and become unable to attend the event, a substitute delegate is welcome at no extra charge. Please contact Sunelec for more information on how to do this. 4. Registration without payment will not be assured of reserved slot/s. First paid, first served. 6. Certificates will be given only to those who have actually attended and completed the training. Those who registered and paid but were unable to attend the training will be given handouts, but not certificates. b) Up to 10 working days before the event date, a 25% cancellation fee will be applicable . Any amounts received by Sunelec will be refunded accordingly within 7 working days via check. c) Up to 5 working days before the event date, a 50% cancellation fee will be applicable. Any amounts received by Sunelec will be refunded accordingly within 7 working days via check. 8. Sunelec will make its best endeavors to run the event per the published programme but reserves the right to alter the programme without notice, including the substitution, alteration or cancellation of speakers, topics or the alteration of the dates of the event. 9. Sunelec is not responsible for any loss or damage as a result of a substitution, alternation, postponement or cancellation of an event. 10. If the seminar is cancelled because of unusual or unforeseeable circumstances or force majeure, Sunelec will refund the seminar fee paid by the participants (but not the incidental costs such as transportation, plane tickets, hotel accommodation, per diem and the like). Please contact Sunelec for more information.